There were two Gideon Gibsons of record on the Pee Dee River in South Carolina. One was shot dead by his nephew in 1781 and the other left South Carolina in 1781 and died in Mississippi in 1792. They both cannot be sons of Gideon Gibson Sr. In 1781 there were two old men on the Pee Dee River in South Carolina named Gideon Gibson, this is proved by the fact that Gideon Gibson was shot dead by his nephew in 1781. It is highly unlikely this Gideon Gibson is the same man, father of Reuben, mentioned here as this Gideon and his son Reuben are found in Natchez, Mississippi records in 1792. Gideon Gibson lived on the Pee Dee River, he had sons besides Reuben, David and Randall. Gideon removed to Natchez, Mississippi by October of 1781. In 1792, he set out to distribute his property to his sons living in the Natchez District. Ruben, Randal, David. p47 - Gideon Gibson to son, David Gibson, 500 arpents on a branch of St Catherine's Creek .... Gideon (x) Gibson, David Gibson. And this is the obituary of David Gibson, son of Gideon Gibson of the Pee Dee River. Jefferson Co., Miss., Dec. 12, te. 57. He was born in (the now) Marion District, S. C., and remembered well the firing of cannon and ringing of bells when the declaration of July, 1776, was promulgated in the district ; also many incidents connected with the early struggle that followed, in his native state, in which his family, father, brothers, and uncles participated. After the fall of Charlestown, they removed to East Tennessee, and spent a year. His descendants and connections are very numerous from South Carolina to California, and are, and have been, among our most useful citizens, comprising men of all honorable callings, preachers, teachers, learned professions, legislators, planters, and merchants. He was remarkable for the urbanity and dignity of his manners ; the perfect integrity and uprightness of his daily walk and conversation; for the preservation and active use of his phvsical strength and mental faculties to within a few days of his death; but more than all was he remarkable for being a living exemplification of that fiiith on which the hope of a happy immortality beyond the grave is founded. ...from memory and a few scraps of memoranda, what little I know of these three leading Gibson families. First; the parents of Rev. Randall Gibson came to the Natchez county (as it was then called), about 1781. In order to avoid the hostile Indians in what is now Western Georgia and Eastern Alabama, immigrants from the Carolinas traveled over land to the Holston River in East Tennessee, where they built family boats and descended the Holston and Tennessee Rivers, etc. Randall Gibson was then about fifteen years old, and I have heard him relate this fact in connection with an attack made on their boat by hostile Cherokee Indians. That should, it seems, prove that there were two Gideon Gibsons on the Pee Dee River if one Gideon Gibson was shot dead by his nephew in 1781 and one Gideon Gibson in 1781 left South Carolina and died 1792 in Mississippi. The above Randall Gibson had a son Tobias Gibson who was the father of General Randall Lee Gibson, who has been the subject of 'blurred racial lines' or the latest AWARD WINNING book by Daniel J. Sharfstein of Randall's SECRET JOURNEY FROM BLACK TO WHITE used to write his biography at Wikipedia. Most people know better than use Wikipedia as a source but Sharfstein is associate professor of law at Vanderbuilt, graduate of Harvard and Yale, I mean this guy has credentials but he is by no means a genealogist, not even a bad one. From THE INVISIBLE LINE this is the SUPPOSED GIBSON FAMILY TREE of Gideon Gibson, ancestor of General Randall Lee Gibson. 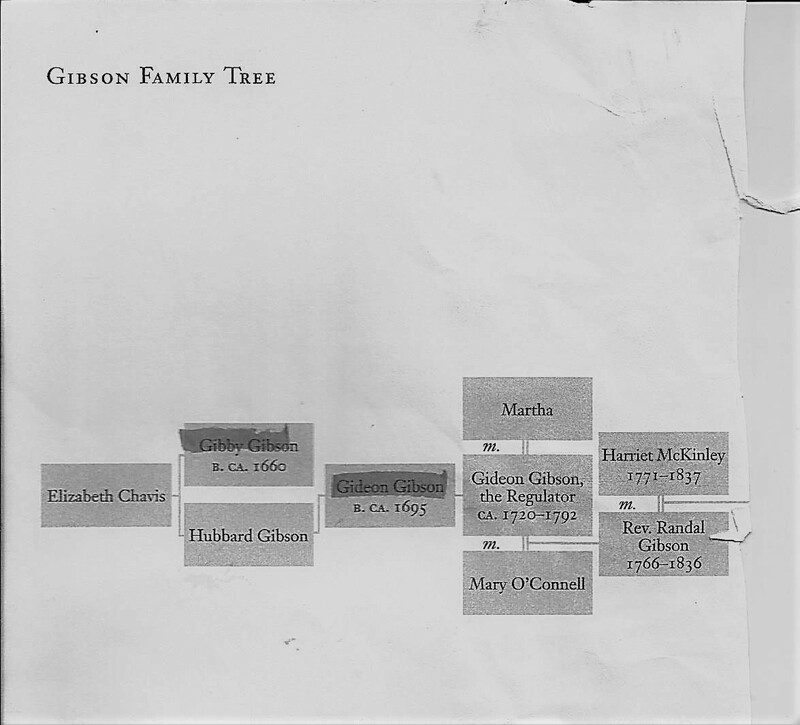 Gideon Gibson born about 1695-1700 married to Mary Browne was not the son of Hubbard Gibson or Gibby Gibson. Hubbard and his son's Edward and Hubbard Jr., with daughter Mary sold the land of Hubbard's deceased son John Gibson who apparently died with no heirs. There is no mention of Gideon Gibson on this deed. Gibby Gibson left a will and named sons Gilbert, Edward and George, no Gideon Gibson. Of course to prove this family was black Gideon has to descend from Elizabeth Chavis. There is nothing in the record of Elizabeth Chavis and her son Gibson Gibson that implies his race, nor is the Gibson DNA Sub Saharan. Randall Lee Gibson and his siblings were in their 40s when their father Tobias Gibson died. Tobias' grandfather was Gideon Gibson of the Pee Dee. Their family history says his father was John Gibson, not Gideon Gibson. Please leave a comment and it will be posted upon approval. Redbone Nation Dedicated to those families, historically known as Redbone. One Tribe, One Nation, One Fire!